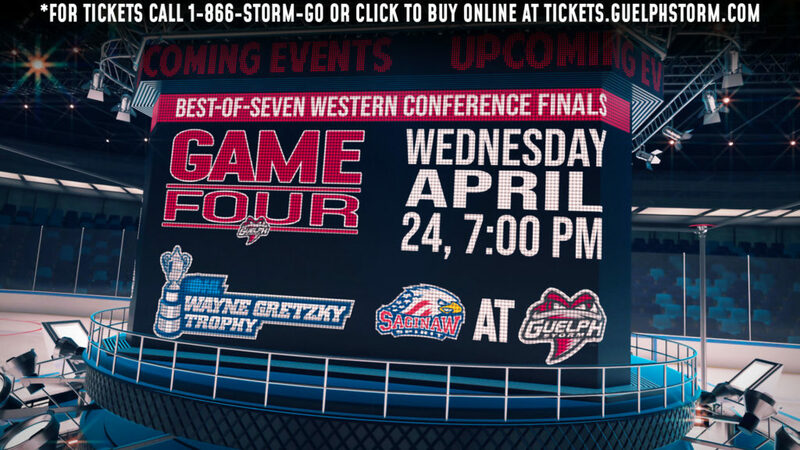 On Friday, the Storm host divisional rivals the Owen Sound Attack for the final time at the Sleeman Centre. 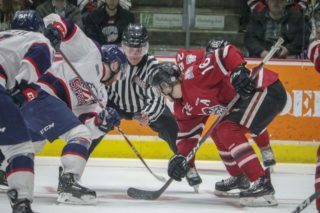 Fighting for position in the Western Conference, Owen Sound currently sits five points ahead of the Storm in the playoff race. Holding the season series lead, winning 4 of the 6 games played, the Storm will look to win one more and narrow the five point gap with a win and the ever important two points. One more game between these two teams is on tap after Friday, in Owen Sound on March 3rd. Owen Sound has been dominating their opposition as of late. Entering this game with a four-game winning streak, they have won nine of their last 10 games. Currently in 5th place in the Western Conference with a 29-20-2-5 record and 65 points, the Attack are three points behind the Knights for fourth and home ice advantage in the playoffs. 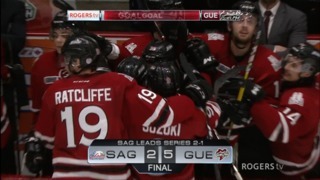 Nick Suzuki is a key part to the Attack’s recent success. Working to build on a six-game point streak, he has 12 points in that stretch. Suzuki has been solid all year, leading the team in scoring with 31 goals and 48 assists for 79 points in 52 games. Playing .500 hockey in their last 10 games and a 4-4-1-1 record, the Storm currently hold the 7th spot in the Western Conference playoff race. With strong play this weekend, there is a solid chance the Storm could move up the standings as they only trail Saginaw by two points, Owen Sound by five and fourth placed London by eight. Rookie forward Cam Hillis has had a great rookie season. As the OHL’s leading rookie scorer, he has 19 goals and 33 assists for 52 points this season. That total is good for a tie for second in team scoring with Ratcliffe. They only trail star defenceman Ryan Merkley by six points. This game highlights the OHL’s ability to produce strong players, as 13 players in this game are drafted to the NHL. Owen Sound forwards Brett McKenzie (Vancouver Canucks, 2016, 7th round), Jonah Gadjovich (Vancouver Canucks, 2nd round, 2017), Maksim Sushko (Philadelphia Flyers, 2017, 4th round), and Nick Suzuki (Vegas Golden Knights, 2017, 1st round) and defencemen Jacob Friend (Los Angeles Kings, 2016, 7th round), Trenton Bourque (St. Louis Blues, 2017, 6th round) and Markus Phillips (Los Angeles Kings, 2017, 4th round) are all picks from Owen Sound. Guelph forwards Liam Hawel (Dallas Stars, 2017, 4th round), Nate Schnarr (Arizona Coyotes, 2017, 3rd round), Alexey Toropchenko (St. Louis Blues, 2017, 4th round) and Isaac Ratcliffe are Guelph’s forwards. The remaining players drafted in this game are Guelph defencemen Dimitri Samorukov (Edmonton Oilers, 2017, 3rd round) and Mark Shoemaker (San Jose Sharks, 2016, 6th round). Guelph captain Garrett McFadden has been one of the best players in the series. He has eight of his total 39 points in the six games against Owen Sound. 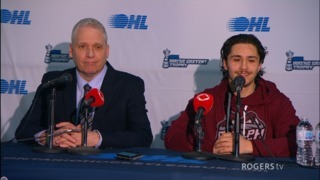 NHL Draft-eligible defenceman Sean Durzi has also been noticeable in this series, as he has put up five points in four games against the Storm, missing the last two games. The Guelph Storm are proud to announce that they will host their 3rd annual ‘PEVS PROTECTS Night’ presented by Linamar on Friday, February 23, 2018, when the Storm take on divisional rivals, the Owen Sound Attack at 7:30 pm at the Sleeman Centre. For tickets to Friday night’s game visit the Storm Box Office at Old Quebec St. Shoppes, order by phone 519-837-9690 or by clicking here! On February 23, volunteers will be on hand at Gate 6 collecting donations in support of PEVS PROTECTS and the Heart and Stroke Foundation. Information tables and a CPR and AED demonstration area will also be a part of the game night. The chuck-a-puck fundraiser will be held during the second intermission, prizes include signed authentic autographed NHL jerseys from Jamie Benn (Dallas Stars), Tyler Seguin (Dallas Stars) and Dallas Stars swag. 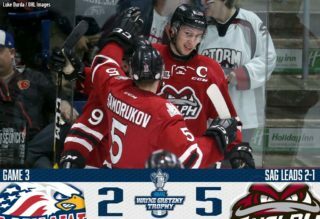 In a busy weekend, that sees the Storm play three games in three days, Guelph will travel to Barrie on Saturday before returning home to host the Mississauga Steelheads on Sunday for a special 4pm start. Tickets are still available for that match up and can be purchased online here.